It’s not very clear how to rewind or fast-forward music on the Apple iPhone, iPad or iPod Touch. The feature is so hard to find that some users think there is no way to do it. You can though, and here’s how. Start the music or track you wish to listen to. Swipe the Control Center up by swiping from the bottom of the screen upward. Swipe left or right until the currently playing track is displayed. Drag the ball on the music timeline bar to the desired spot. 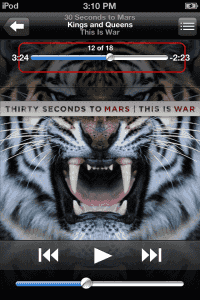 Alternately, you can tap and hold the fast-forward or rewind buttons as well to skip ahead or backtrack respectively. Hold the device in a portrait orientation. 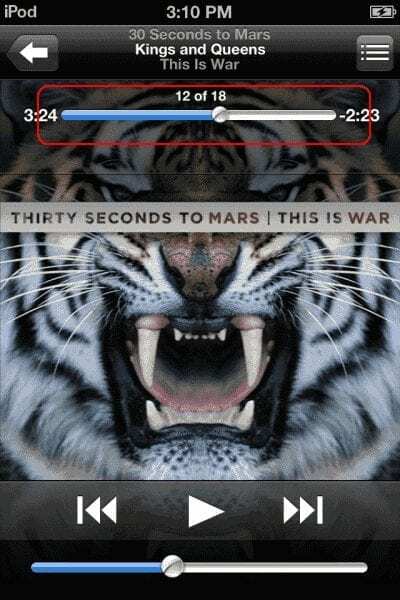 While a song is playing, the album art will appear. If there is no album art, a music note appears instead. Tap the album art/note. Now you will see a bunch of features you may not be aware of. One of them is the line that indicates where on the music track your song is playing. You can now drag the ball back and forth to fast forward or rewind. Thanks for posting , but what you have here is way too old. Apple Iphone do not have an option to fast forward or rewind to in music app anymore accept that fast or rewind for 30s . Yes you can drag a ball on music timeline back to the beginning of the song but it would not take you back to the previous songs. 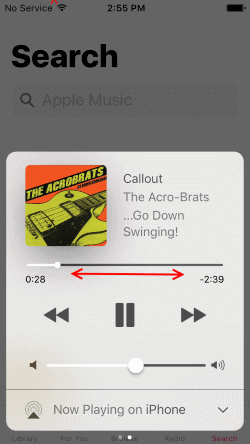 You drag it down all the way and it will jump to the next songs.. it is very very annoying but I guess APPLE do not care and do not want to fix it. I am using Iphone X with the latest IOS 12.1.4. All I want back is the old fashioned rewind and FF buttons! I have found this to work on mp3 files that are less than 4 hours in length. But after four hours, you can’t fast forward at all. The phone thinks a 7 hour audio book is only 4 hours long. The file will play beyond the four-hour mark, but you can’t control where you are in the book after that mark. If you pause and then hit play again, the book returns to the four-hour mark. Highly annoying. Is there a fix?